Today, the entertainment industry and soul music fans all over the world were reacting to the loss of Whitney Houston. With a tally of over 400 awards and a career spanning nearly 35 years, Houston was also an actress, model, film producer, record producer and songwriter. As one of the best selling women recording artists in history, she is reportedly the only artist able to claim eight consecutive multi-platinum albums and the woman with the biggest selling debut album in the world. Along with this, Houston was one of the first black women artists to be featured heavily on MTV at a time when the network was notoriously bad at giving exposure to women of colour in the music industry. Her popularity arguably pushed things in the right direction, perhaps similarly to when -some years before in 1981- she became the second black model to appear on the cover of the American magazine Seventeen, when black people were under-represented in it. However, as The Guardian reports, the magazine made her share the space with a white model, so they could have done better. …She sang Home, from the soundtrack of The Wiz, and her vocals were flawless, but her frumpy ruffled dress and short, natural hair didn’t project what Arista considered the right – saleable – image. By the time her first album came out, in 1985, she’d been given a thorough makeover: the cover photo showed a sleek-haired, golden-skinned sylph wearing an elegantly draped white gown. Something more heartening that I discovered in the piece in The Guardian was that Whitney provided vocals for a track for the jazz-funk-punk mutant disco act Material! Hearing the offbeat melancholy of ‘Memories’ is a great reminder of what a versatile performer Whitney Houston was and that she was more than simply the Queen of Pop she later became. Mind you, she obviously made a pretty damn good Queen of Pop too. To say she’ll be sadly missed is an understatement. 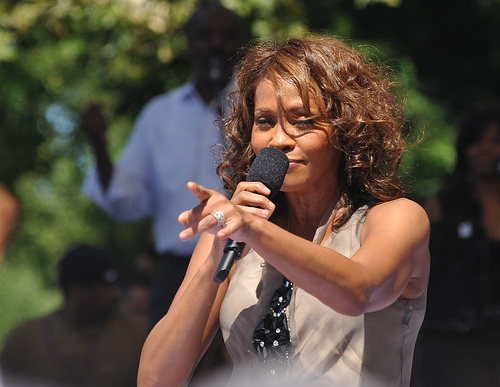 Picture of Whitney Houston performing at a concert in Central Park (Good Morning America 2009 – Manhattan NYC) by asterix611, shared under a creative commons licence.